Alliance Newcastle Councillor Patrick Clarke has asked DRD Roads Service to provide a footpath along the Main Bryansford Road leading from Newcastle towards Bryansford village and Tollymore Forest Park entrance. Councillor Clarke has raised the issue with Roads Service following concerns from walkers and constituents who walk this stretch of road. 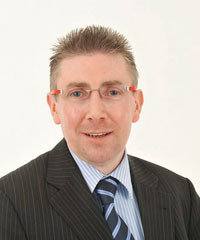 Councillor Patrick Clarke has called for a footpath on the Bryansford Road. Councillor Clarke said: “I have been contacted by a number of concerned constituents who are also keen walkers about the total lack of proper footpath provision along the main Bryansford Road leaving Newcastle heading towards Bryansford village and in particular up to the entrance of Tollymore Forest Park along the Bryansford Road opposite the Middle Tollymore Road junction. “These walkers have indicated that walking past the Eniskeen Hotel towards the Tollymore Forest Park entrance has become increasingly dangerous due to the lack of a footpath. “I believe this issue has been previously raised with Roads Service in the past by myself as far back as April 2012. However, to date Roads Service have refused to act they say due to budget constraints and that this road section is a lower priority to other competing schemes in Down District Council area which I find very disappointing. The Bryansford Road is a main route and a very popular road for walkers and also cyclists particularly from March to September. “I would therefore like Roads Service to again look into this matter as I believe that with the increased amount of people enjoying leisure recreation and a healthier lifestyle many are choosing to walk and cycle as opposed to using a car along the Bryansford Road.